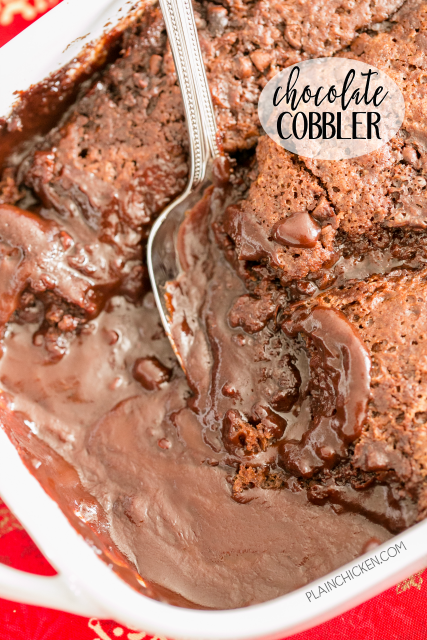 Chocolate Cobbler - seriously delicious! Only takes a minute to prepare and it tastes AMAZING! Perfect ending to your meal. Butter, sugar, flour, milk, cocoa powder, vanilla, chocolate chips and boiling water. Serve warm out of the oven with vanilla ice cream. SO GOOD! This recipe was inspired by the Pecan Cobbler that I shared with you last month. I LOVE the pecan version so much that I decided to think of other flavor combinations. 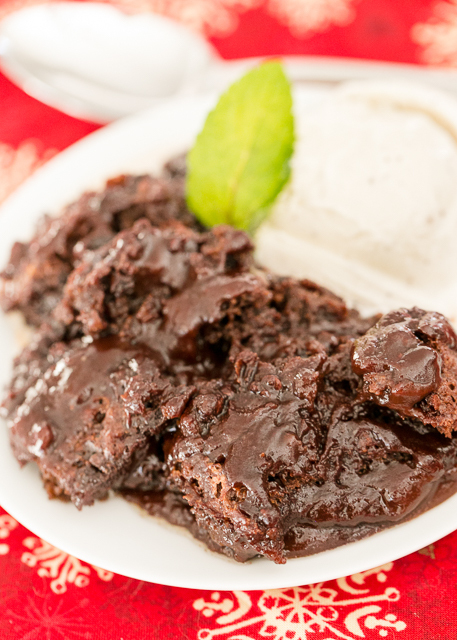 Chocolate is a must at the holidays, so I decided to give a Chocolate Cobbler a whirl. OMG ! SO good! This dessert is best served warm out of the oven. Also, be careful not to overtake the cobbler or there won't be any of the incredible molten chocolate sauce. Trust me, you want the sauce!! We served this with vanilla ice cream, but it would also be delicious with fresh whipped cream. Feel free to add some mint to the cobbler mixture before baking. I would start with 1/4 teaspoon - a little mint extract goes a long way! In a medium bowl whisk together 3/4 cup sugar, flour, baking powder, salt, milk, 2 Tbsp cocoa powder and vanilla. In a separate bowl, combine the remaining 1 cup of sugar, 4 Tbsp cocoa powder and chocolate chips; sprinkle evenly over the batter. Bake 40 to 45 minutes, until top of the cobbler looks set. Do not overcook or there won't be any yummy chocolate sauce. One of my favorite easy recipes to feed a crowd. Sometimes I add a few pecans. I think it is also known as Hot Fudge Cake. This looks delicious! However, my daughter has a dairy allergy. Do you think it would work if I replace the butter with oil (or coconut oil) and the whole milk with almond milk?